The torch spent its final hours north of the border in Dumfries before crossing over into North West England. Ryan Dollard was there to see it. 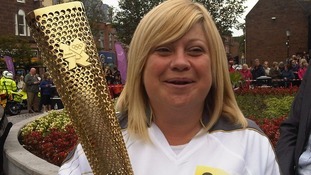 Dumfries Torchbearer: "I'm doing this to inspire my kids"
"I was chosen because I have been working for charities since I was 16. I have two disabled kids and I am also doing this to inspire them. You don't have to be rich, you don't have to be super talented. If you work hard and do your best then opportunities like this come along in your life"